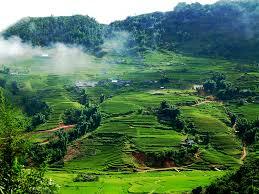 Hoa Binh is a mountainous province in the North. It is bordered by Phu Tho and Ha Tay in the north, Ninh Binh and Thanh Hoa in the south, Ha Nam in the east, and Son La in the west. The topography is combined by mountains and narrow valleys. The annual average temperature varies between 23 - 25oC. Tourists especially enjoy the ethnic specialty dishes including rice cooked in bamboo and grilled meat. At night, visitors can stay in stilt houses at Lac Village in Mai Chau Valley, enjoy watching traditional dancing, music performances (bronze drums, gongs), and Thai minority singing and dancing. The remote Muong, Dao, Tay minority villages draw visitors who like study the life of ethnic groups. Beautiful brocade and forest products are interesting souvenirs. Road and water transportation are convenient. There is National Highway No. 6 from Hanoi vie Ha Tay to Hoa Binh, Son La, National Highway No. 15 from Mai Chau to Thanh Hoa, National Highway No. 12B from Hoa Binh to Nho Quan (Ninh Binh).